When you make an order from stoffe.de, they conveniently send you a small booklet of next season’s Burda Style patterns. I thought I would have a little peruse before I put it in the recycling, and came across this cool pattern for a sweatshirt. I loved View B with the roll neck style and thought it would really suit my partner. I asked PB if it was something he’d like me to make and he seemed to be a pretty keen bean, so I promised him it was finally his turn to get something home made and we had some chats about fabric. He really wanted the check version as shown on the pattern packet, but I was a bit scared by the idea of matching the checks and fortunately in the end I couldn’t find any checked sweatshirt fabric! As a result we had to settle for a sensible charcoal grey with black cuffs and waistband. 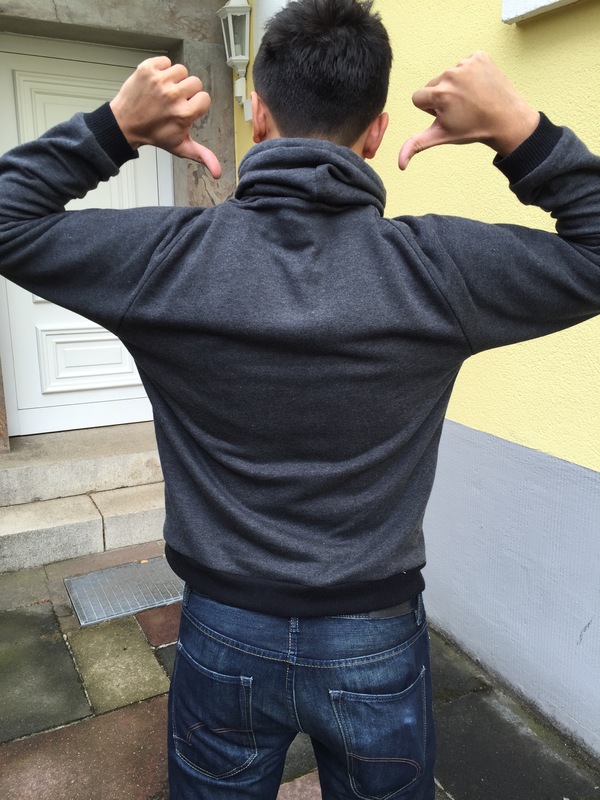 Surprisingly I couldn’t find any fabric for the cuffs and waistband online (potentially because I didn’t know the right German word to get exactly what I was looking for) so in the end I went to trusty Karstadt. 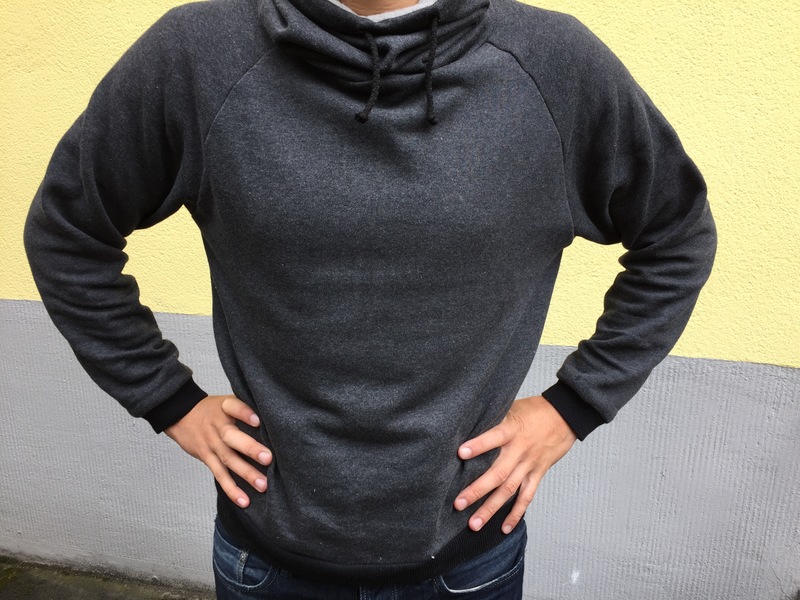 I managed to get the required 2m of charcoal grey sweatshirt fabric along with 35cm of black ribbed fabric for the cuffs. It was an occasion where I was pleased to be able to hold the fabric in my hand and know exactly what I was getting, but I’m starting to think I should maybe just get my paycheck diverted to Karstadt at the moment! The fabric turned out to be really lovely and soft on the inside and was a treat to work with. This pattern is so easy, it really does warrant its ‘super easy’ label. I think the fact that I have done so much sewing with jersey recently also helped. I feel like I spend every Saturday attaching cuff bands and waist/neckbands at the moment which meant it was really easy to just stitch these on! After I’d cut my fabric I did realize I had made a fatal error though … It turns out Burda style patterns NEVER include seam allowances and I had not added them on. Measure twice, cut once Amy, measure twice cut once. Fortunately for me, PB is on the smaller side of the pattern size I cut, so I decided to plough on and fit as I went. I used the overlock stitch on my machine (my new best friend) which gave a great finish on the inside as well as requiring considerably less than the suggested 5/8 seam allowance. Poor PB, every time I sewed a piece together, I made him get up from the couch and try it on, but the result in the end was actually a great fit! The only change I would make next time is to lengthen the sleeves ever so slightly. Hell, I might even add a seam allowance! I love the snuggly oversized collar so much, I think I might even make one of these for me for the winter. The only change I made to the collar was to leave out the eyelets. From a cost perspective they were quite expensive and it seemed a shame to buy a pack of 50 when I only needed two! Instead I cut two small holes and finished them with a tiny repetitive zig-zag stitch, a bit like a button hole. The result was actually quite tidy and they seem to function just fine. The whole project only took 4 hours from start to finish, which is a pretty speedy make. Overall I’m really pleased with this project – I think there might be a few more to come! As my first venture in to men’s clothing it was a real confidence builder, and now every time PB puts it on I feel all proud! How about you? Do you have any makes you are particularly proud of? Do you also sew things for friends and family? What as great pattern and what an awesome make from you, looks very stylish on your man. I have been looking for an easy project to make for Mr B and he loves a snuggly sweater so this might just do the trick, great recommendation Amy. Thanks sarahkate I’m so glad you liked it! I was so pleased with this one I think it’s one of my favourite makes! The pattern is also not too expensive 🙂 looking forward to seeing yours if you make one! I believe all Burda patterns now, except Burdastyle magazine, include seam and hem allowances now…in Canada anyways. the term you were looking for is “Bündchenware”. 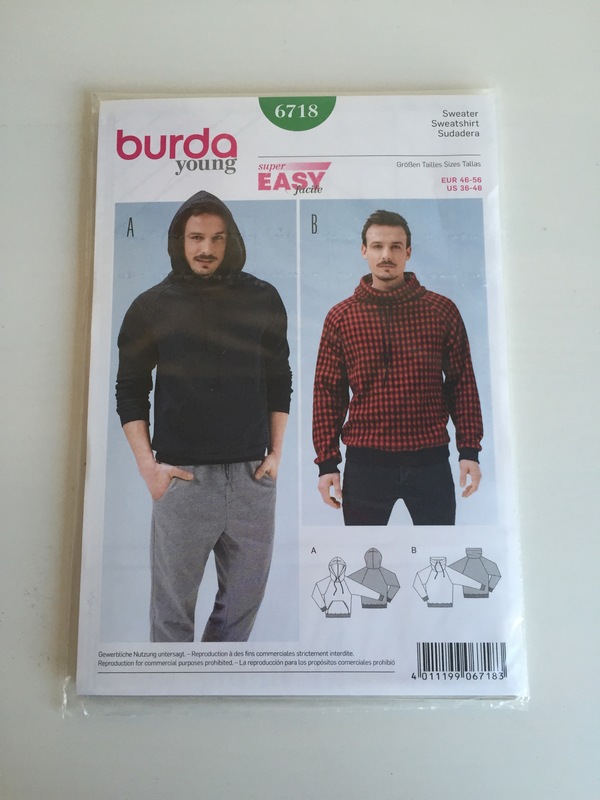 Also all english Burda paatern include the seam allowance, but the german ones do not. I’m making the pattern right now and I am amazed about how easy it really is. Great work!! Thanks for the heads up on no seam allowances! Geez…I am about to tackle this bad boy next week and I will be sure to remember that. Yeah it makes me crazy why they don’t put Seam allowances on things! Who has time to go adding seam allowances by hand! Hope it turns out well! !